In this article, the authors describe a case study approach used to examine the complexities and contradictions of ways teachers perceive and implement technology in a seventh-grade social studies class. The participants in this qualitative research study were a 13-year veteran social studies teacher and the student intern who worked with this teacher during a year-long professional development school experience in a culturally and economically diverse middle grades school. Using interviews and classroom observations, the authors portrayed the beliefs and practices of the two participants in relation to their views of technology and its uses in the classroom. The findings support and deepen current literature and suggest that, although teachers believe that technology can be used to help engage students in thinking critically to promote self-regulated learning and improve literacy skills, such beliefs do not always come to fruition in actual classroom practice. Shifflet, R. & Weilbacher, G. (2015). Teacher Beliefs and Their Influence on Technology Use: A Case Study. 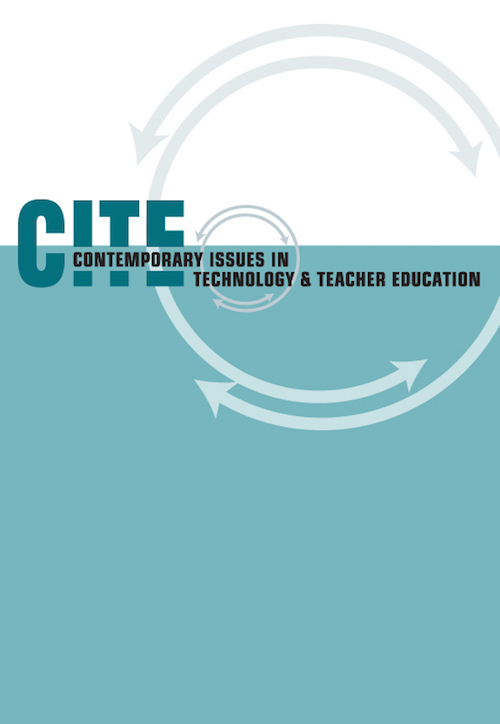 Contemporary Issues in Technology and Teacher Education, 15 (3), 368-394. Waynesville, NC USA: Society for Information Technology & Teacher Education. Retrieved April 19, 2019 from https://www.learntechlib.org/primary/p/147400/. Apple, M.W., & Beane, J.A. (1995). Democratic schools. Alexandria, VA: Association for Supervision and Curriculum Development. Bennett, S., Maton, K., & Kervin, L. (2008). The 'digital natives' debate: A critical review of the evidence. British Journal of Educational Technology, 39(5), 775786. Brown, J.S. (2002). Growing up digital: How the web changes work, education, and the ways people learn. USDLA Journal, 16(2), 11-20. Bruner, J.T. (1993). Schools for thought: A science of learning in the classroom.Cambridge, MA: MIT Press. Chen, C. (2008). Why do teachers not practice what they believe regarding technology integration? The Journal of Educational Research, 102(1), 65-75. Chan, K., & Elliott, R.G. (2004). Relational analysis of personal epistemology and conceptions about teaching and learning. Teaching and Teacher Education, 20, 817-831. Collins, A., & Halverson, R. (2009). Rethinking education in the age of technology: The digital revolution and schooling in America. New York, NY: Teachers College Press. Dewey, J. (1998). Experience and education: The 60th anniversary edition. West Lafayette, IN: Kappa Delta Pi. Ertmer, P.A. (1999). Addressing first-and second-order barriers to change: Strategies for technology integration. Educational Technology Research and Development, 47(4), 47-61. Ertmer, P.A. (2005). Teacher pedagogical beliefs: The final frontier in our quest for technology integration. Educational Technology Research and Development, 53(4), 25-39. Ertmer, P.A., Ottenbreit-Leftwich, A.T., Sadik, O., Sendurur, E., & Sendurur, P. (2012). Teacher beliefs and technology integration practices: A critical relationship. Computers and Education, 59, 423-435. Ertmer, P.A., Ottenbreit-Leftwich, A.T., & York, C.S. (2007). Exemplary technology-using teachers: Perceptions of factors influencing success. Journal of Computing in Teacher Education, 23(2), 55-61. Fisler, J.L., & Firestone, W.A. (2006). Teacher learning in a school-university partnership: Exploring the role of social trust and teaching efficacy beliefs. Teachers College Record, 108(6), 1155-1185. Fullan, M. (2013). Stratosphere: Integrating technology, pedagogy, and change knowledge. Don Mills, ON: Pearson. Hennink, M., Hutter, I., & Bailey, A. (2011). Qualitative research methods. Los Angeles, CA: SAGE. Hew, K.F., & Brush, T. (2007). Integrating technology into K-12 teaching and learning: Current knowledge gaps and recommendations for future research. Educational Technology Research and Development, 55, 223-252. Hughes, J. (2005). The role of teacher knowledge and learning experiences informing technology-integrated pedagogy. Journal of Technology and Teacher Education, 13(2), 277-302. Judson, E. (2006). How teachers integrate technology and their beliefs about learning: Is there a connection? Journal of Technology and Teacher Education, 14(3), 581-597. Kagan, D.M. (1992). Implications of research on teacher belief. Educational Psychologist, 27(1), 65-90. Lajoie, S.P. (2000). Computers as cognitive tools, Volume 2: No more walls: Theory change, paradigm shifts, and their influence on the uses of computers for instructional purposes. Mahwah, NJ: Lawrence Erlbaum Associates. Lansing, A. (2007). Endurance: Shackelton’s incredible voyage. Philadelphia, PA: Basic Books. Lei, J. (2009). Digital natives as preservice teachers: What technology preparation is needed? Journal of Computing in Teacher Education, 25(3), 8797. Levin, T., & Wadmany, R. (2005). Changes in educational beliefs and classroom practices of teachers and students in rich technology-based classrooms. Technology, Pedagogy and Education, 14(3), 281-307. Liu, S. (2011). Factors related to pedagogical beliefs of teachers and technology integration.Computers & Education, 56, 1012-1022. Mischler, E. (1986). Research interviewing: Context and narrative. Cambridge, MA: Harvard University Press. Mueller, J., Wood, E., Willoughby, T., Ross, C., & Specht, J. (2008). Identifying discriminating variables between teachers who fully integrate computers and teachers with limited integration. Computers& Education, 51, 1523-1537. Oblinger, D.G. (2008). Growing up with Google: What education. Emerging Technologies for Education, 3(1), 10-29. Patton, M.Q. (2002). Qualitative research and evaluation methods. Thousand Oaks, CA: Sage. Prensky, M. (2001). Digital natives, digital immigrants, Part 1. On the Horizon, 9(5), 1, 3-6. Richardson, S.A., Dohrenwend, B.S., & Klein, D. (1965). Interviewing. New York, NY: Basic Books. Richardson, V. (2003). Constructivist pedagogy. Teachers College Record, 105(9), 1623-1640. Russell, M., Bebell, D., O'Dwyer, L., & O'Connor, K. (2003). Examining teacher technology use: Implications for preservice and inservice teacher preparation. Journal of Teacher Education, 54(4), 297-310. Selwyn, N. (2009). The digital native-myth and reality. Aslib Proceedings, 61(4), 364-379. Strauss, A.L. (1987). Qualitative analysis for social scientists. Cambridge, MA: Cambridge University Press. Tapscott, D. (2009). Grown up digital: How the net generation is changing your world. New York, NY: McGraw Hill. Thornton, S.J. (1989, March). Aspiration and practice: Teacher as curricularinstructional gatekeeper in social studies. Paper presented at the annual meeting of the American Educational Research Association, San Francisco, CA. Walker, L.R., & Shepard, M.F. (2011). Phenomenological investigation of elementary school teachers who integrated instructional technology into the curriculum. Journal of Educational Research and Practice, 1(1), 23-35. Watson, G. (2006). Technology professional development: Long-term effects on teacher self-efficacy. Journal of Technology and Teacher Education, 14(1), 151165. Wozney, L., Venkatesh, V., & Abrami, P.C. (2006). Implementing computer technologies: Teachers' perceptions and practices. Journal of Technology and Teacher Education, 14(1), 173-207. Wright, V.H., & Wilson, E.K. (2006). From preservice to inservice teaching: A study of technology integration. Journal of Computing in Teacher Education, 22(2), 49-55. Zhao, Y.(2007). Social studies teachers' perspectives of technology integration. Journal of Technology and Teacher Education, 15(3), 311-333.